If you are a fitness fanatic and love to lift weights, you probably know all about protein supplements from your gym buddies. Protein powders, bars, shakes, gels and capsules have become all the rage in the fitness world these days. Consumed by athletes, bodybuilders and regular Joes alike, supplements are generally used to increase protein intake and help stimulate faster muscle growth. However, there are two sides to every story, and protein supplements also have their downsides. Here, we explore the top-level pros and cons of protein supplements. Protein tends to keep you feeling fuller for longer than simple carbohydrates, which means that if you supplement your diet with protein, you may eat fewer calories as a result. According to a 2010 study carried out by researchers at University of Ulm, participants who used high-protein meal replacements as part of a low-calorie diet lost more weight and fat over a year than subjects who did not use the supplements. 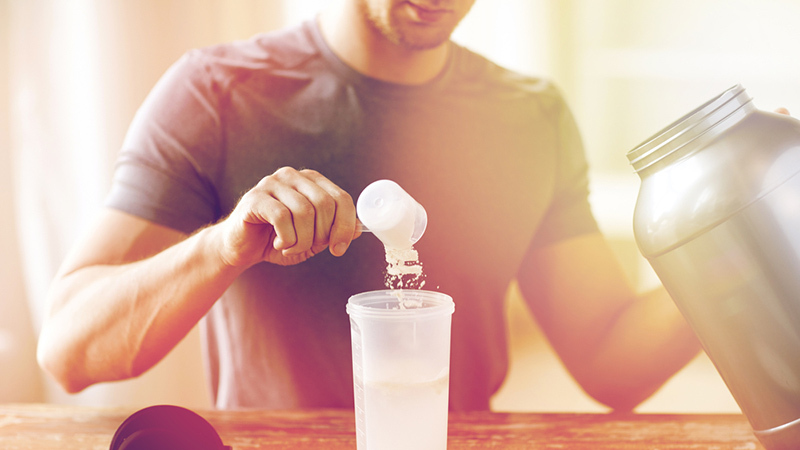 When it comes to protein powders and protein shakes, fast absorption levels are a given. Whey protein, for example, is easily absorbed by the body, especially in liquid form. Fast absorption is ideal after a strength-training or weight-lifting session, as it’s generally recommended to fuel your muscles with at least 20 grams of protein up to 30 minutes after a workout to feed your muscles and maximize your gains. Some protein supplements contain an ingredient called creatine, which is produced from amino acids and serves as a nitrogenous organic acid. Translation? Creatine can help boost physical performance and promote muscle growth. When combined with regular resistance training and workout, protein supplements can lead to a significant increase in muscle mass. Whey protein powder, in particular, works exceptionally well for people who want to increase their lean muscle. One study was carried out by researchers at Baylor University found that 19 men who performed resistance training and consumed whey and casein protein and amino acids over a period of 10 weeks showed a greater increase in muscle and strength compared to the placebo group. While these protein supplements come with numerous benefits, some of them also contain harmful ingredients and substances which can be detrimental for both your health and body. UK Medicines and Healthcare Regulatory Agency conducted an investigation which found that some supplements contain dangerous ingredients, like stimulants. In the long term, these unsafe ingredients can cause many serious problems like seizures, heart problems and kidney failure, to name a few. It’s widely believed that protein supplements are great sources of dietary protein, but that’s only partly true. While protein supplements are great to, well, supplement your diet, they can never be equated with whole-protein foods like eggs and chicken in terms of nutritional value. Natural sources of protein contain antioxidants, nutrients, vitamins, dietary fibre and more, which may not be present in these supplements. So if you think replacing whole foods with protein supplements for energy and nutrition is a good idea, you might want to think again, because the latter will likely lead to deficiencies. The ingredient creatine present in supplements — which boosts performance as mentioned earlier — is not without its drawbacks. Research has come up with certain health risks associated with creatine, such as feelings of anxiety, weight gain, kidney issues, vomiting and nausea. This is why it’s always a good idea to cycle your supplements and take regular breaks. Creatine can also react with certain medications which you might be consuming simultaneously and may lead to adverse side effects. Some people may also not respond well to these supplements, due to individual differences in their physiological makeup. In either case, one needs to be cautious before buying and consuming any of these protein supplements. Another concern that has been raised through research is that protein powders, in particular, may contain ingredients other than proteins such as herbs which often come from herbal wellness centers. These herbs may not be suitable for pregnant women or children and mothers who breastfeed. While protein supplements can facilitate in gaining lean muscle mass and promoting fat loss, they can also ironically lead to fat gain due to the number of calories in them. Adding protein supplements to your diet, in the form of shakes, powders or bars, means adding additional calories, often with sugar involved. If you don’t burn these calories while consuming them, you are likely to gain fat and weight. Whey protein, for instance, often comes with added sugars and carbohydrates. You don’t want to supplement your diet with whey protein shakes if you’re not also working hard at the gym, because those added calories will be turned into fat. Keep in mind that any artificial food or product with unnatural ingredients will have side effects. Always consult your nutritionist, doctor or personal trainer to see if protein supplements are right for you. And as with anything, moderation is key. Don’t forget to check out our comprehensive guide on protein powders and supplements to find the best ones for you and your specific goals.